The Lifetime Animal Care Center team of skilled veterinarians welcomes you to our practice. Proudly serving the San Diego area. At Lifetime Animal Care Center, it is our daily privilege to provide quality vet care to your cherished pet, with compassion and competence. We hope to ensure a positive impact on our patients, pet owners and the local community. 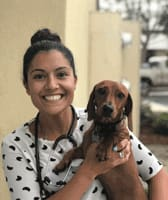 A San Diego native, I joined Lifetime in September 2017 as an experienced & motivated veterinarian with a unique education and clinical background. I graduated with honors from UC Davis in 2005 and then spent two years in advanced training at the Veterinary Specialty Hospital in Sorrento Valley. After a rotating internship at VSH, I spent another year of intensive training in critical care, emergency, anesthesia, and pain management in an ICU setting. 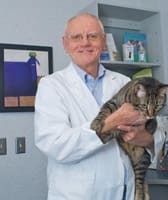 I then spent over 5 years as an associate veterinarian at the San Diego Humane Society, where I developed my skills in internal medicine and surgery, including many advanced soft tissue and orthopedic surgeries. I am also experienced, trained, and have a special interest in ultrasound and endoscopy. While serving as a Clinical Assistant Professor with Western University, I mentored students during their external rotations and led the organization of a shelter medicine internship at San Diego Humane Society, mentoring two intern classes during my time at the shelter. I serve as a clinical advisor for the FACE Foundation for Animals, a local non-profit organization which helps families in financial need and I enjoy working for high-volume spay and neuter organizations in the San Diego Area. In my spare time, I spend time with my family, including dogs John Wayne & Karma. I also play softball, golf, and love the beach. My interest in animals started while growing up in Wisconsin. We lived outside of Milwaukee and had a menagerie of chickens, ducks, dogs, cats, and horses. While I enjoyed those "family pets" my real respect for animals came through the many summers I spent on my uncle's dairy farm. Working with the cows and calves and seeing how well they were treated and cared for made me want to somehow be involved with animals. I moved to California after high school and eventually received my degree in veterinary medicine from the University of California, Davis. I felt I owed something to the Wisconsin dairy industry for establishing my interest in animals and moved back there to work as a dairy vet. After four years, my wife Margaret and I decided that California had more opportunities for our family than Wisconsin, so we returned, moving to San Diego in 1984. I purchased this practice, then called Clairemont Square Veterinary Clinic, in 1986. We started with one doctor and two veterinary assistants. Since then, through the overwhelming support of our clients, we have been able to expand the hospital and have grown tremendously. What I enjoy most is getting to know my clients, seeing what their pets mean to them and how they bring quality to each others' lives. I enjoy helping the pets in any way I can to make their lives, and the lives of their owners, more comfortable. I currently live in Scripps Ranch with my wife, Margaret. My love for animals developed when I was very young. I have always lived in a household which was open to me bringing home dogs and cats that got lost around the neighborhood, turtles that found their way out of the local park, and birds that got injured or fell out of their nest. I developed a deep respect for nature and felt proud when I could rehabilitate something that might not have survived otherwise. When I got to high school I began volunteering at veterinary clinics, and I knew that was what I wanted to do with the rest of my life. I attended the University of California San Diego for my undergraduate degree in Ecology, Behavior and Evolution, and also earned a minor in Marine Sciences. This furthered my passion for wildlife rehabilitation and conservation, which I have continued to try and pursue alongside my career in veterinary medicine. I was lucky enough to attend the University of California, Davis for my veterinary degree, which allowed me to stay in California with my family for the greater part of each year. During the summer breaks from veterinary school, however, I would pursue international opportunities, including a research study on the critically endangered Przewalski’s horses in Hungary and an internship at the World Health Organization. I feel this expanded my world view and allowed me to appreciate what a variety of opportunities exist in the realm of veterinary medicine. After veterinary school, I did a rotating internship in small animal medicine and surgery, with a strong focus on emergency medicine. I also took time to shadow specialty avian veterinarians and high volume spay/ neuter shelter veterinarians to improve those specific skill sets. While I still harbor a passion for public health, I managed to adopt two cats, a chinchilla and a guinea pig over the course of my veterinary career and feel a responsibility to be a “parent” of sorts for the next chapter of my life! 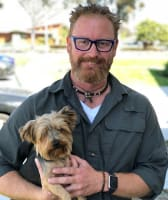 I am excited to start work at Lifetime Animal Care Center, as I feel it will give me the opportunity to bond with and educate clients about pet care, and be a part of their pet’s long term health and well-being. I understand how easily pets can become part of the family and how consequential their happiness is to our own. In my spare time I like to hike, bike, and swim, and get outside in the San Diego sun and sea. My significant other is a navy officer, so travel is also a big part of our lives, but we are always the happiest and most fulfilled at home surrounded by our animals.